carefully cut into the geometrical shapes that allow the diamond to sparkle and shine, then the entire diamond is cut into a specific shape, such as an emerald cut or a princess cut diamond. 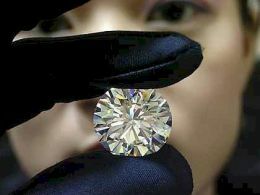 Once the cut is done, the diamond is put into a dop, which resembles a cup with another diamond – only a diamond is strong enough to smooth the edges of another diamond. Once the diamond has been cut and shaped, and had the edges smoothed in the dop, it is polished on a scaif or a diamond polishing wheel.